Last May, record amounts of rain fell on northeast Texas, causing the Wichita River to overflow its banks and flood swaths of Wichita Falls, a city of about 100,000 people. Among the many businesses inundated was Super Thin Ribbons, a provider of ribbons and medals to the U.S. military. “We’re not in a flood plain, so the damages weren’t covered by insurance,” says Marcie Lowder, owner of Super Thin Ribbons, which may take in $900,000 in a good year. To obtain funds to repair damages to the office building and replace inventory and office equipment, Lowder turned not to a bank but to an alternative lender — The Business Backer, a Blue Ash, Ohio-based firm. In two days Lowder secured a six-month loan, doing the entire transaction online from her desk. “It was very easy,” she says. Lowder is one of a growing number of small-business owners who are turning to nonbank alternative lenders for short-term loans and working capital. Small businesses have generally found it more difficult to obtain conventional bank financing since the economic downturn, as banks became more risk averse and companies’ creditworthiness and collateral deteriorated. 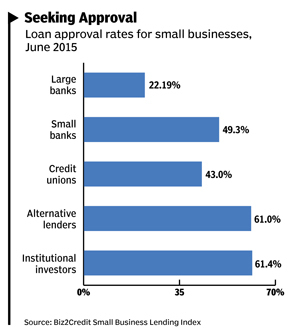 According to Biz2Credit, an online loan marketplace, large banks approved 22% of small-business funding requests in June, while small banks approved 49% (see chart, below). Hence the rise of alternative lenders. They offer two big advantages over banks: much higher approval rates — alternative lenders approved 61% of small-business loan applications in June — and a far faster application process, often done online. By comparison, research by the Federal Reserve Bank of New York shows that small businesses spend, on average, 33 hours applying for credit, contacting three financial institutions and submitting three credit applications. Those advantages come at a price. Credit from alternative lenders is far more expensive than traditional bank loans; at some lenders, annualized interest rates for merchant cash advances can reach triple digits. But alternative lenders make no apologies for their rates, citing their higher cost of capital and the general riskiness of small businesses. They assert that their customers measure the cost of short-term loans by payback rate and return on investment, not an interest rate. Moreover, they are quick to point out that when a business needs cash to address unexpected needs or opportunities, an alternative lender is frequently better than the alternative — which is to say, no cash at all. 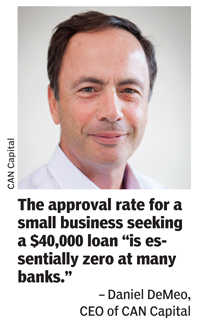 For a small business seeking a $40,000 loan, the approval rate “is essentially zero at many banks,” says Daniel DeMeo, CEO of alternative lender CAN Capital. “Sometimes things come up that you didn’t anticipate,” says Marcie Lowder. “It’s nice to have something to fall back on.” Below, we profile three leading alternative lenders that have provided hundreds of millions of dollars in a pinch. The alternative lender that Super Thin Ribbons falls back on, The Business Backer, is both a direct funder and facilitator, helping small businesses obtain everything from near-prime bank loans to equipment financing and alternative products. 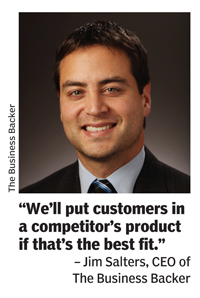 “We’ll put customers in a competitor’s product if that’s the best fit,” says CEO Jim Salters. The Business Backer’s customers range in size for the most part from $500,000 to $10 million in annual revenue, says Salters. To qualify for financing, customers must have been in business at least one year and have annual revenue of at least $150,000, while a business owner must have a FICO score of at least 550. Salters says his firm has done more than 10,000 transactions since its startup in 2007, totaling more than $300 million in financing, and enjoys an A+ rating from the Better Business Bureau. The firm’s flagship product is The Business Backer Revolving Line, which works similarly to a line of credit. Customers can draw up to $200,000 over 18 months, but the average amount and term are $37,500 and 9 months, respectively. The cost of the Revolving Line is presented as total payback amount plus cost of funds. The size of repayments mirrors the customer’s sales: if sales decline by 10%, so do the repayments. That means the duration of the financing is variable, too. New financing is simply added on to the end of the existing contract. Refinancing a traditional loan “piles costs on the borrower,” says Salters. Because the cost of the original loan is built into the loan balance from the start, “if that financing is paid off early, it drives the effective cost way up.” Moreover, the Revolving Line doesn’t require a personal guarantee. “As long as you don’t commit fraud or breach the contract and tell us to pound sand, borrowers have no personal liability,” says Salters. We are the largest and longest-tenured player in the alternative lending finance space,” says Daniel DeMeo of his firm, CAN Capital. “We have a strong balance sheet and more data and experience than anyone else in the category.” Since its founding in 1998, the privately held company has provided access to more than $5 billion in working capital through more than 160,000 small-business transactions, encompassing some 540 SIC codes. DeMeo says the company’s trove of business data, proprietary credit-scoring model, and technology platform result in high yes rates for small businesses like restaurants, spas, medical and dental practices, and auto parts suppliers. Increasingly that funding is done online, approved in real time. “We’re mindful that business owners have businesses to run,” DeMeo says of the quick turnaround on financing requests. CAN Capital’s digital business grew 600% in 2014. Overall, growth in both funding transactions and revenue is north of 25% for the alternative lender, which has been profitable since 2008 and also boasts an A+ rating from the Better Business Bureau. The current run rate for funding transactions facilitated in 2015 is between $1 billion and $1.2 billion, says DeMeo. 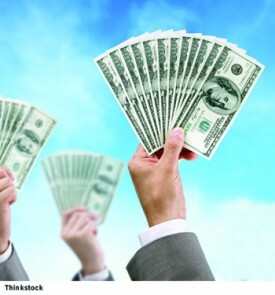 Approximately 70% of the company’s customers renew their financing. Even faster to obtain is a merchant cash advance, whereby CAN Capital purchases a portion of a small business’ future payment card receivables at a discount. To repay the advance, the business remits a fixed percentage of its daily payment card revenue, which means payments rise and fall along with a customer’s sales volume. DeMeo says his small-business customers think about short-term loans in terms of return on investment, not annualized interest rates. A restaurant, for example, might take out a six-month, $40,000 loan to enclose a porch and add more tables. The excess of the daily revenue generated by the tables over the daily payment on the loan is the ROI. When the loan is repaid, “it’s all gravy from that point,” says DeMeo. CAN Capital, meanwhile, has recently procured major financing of its own. Last year, for example, the company raised $200 million in an investment-grade securitization. In April the company secured a $650 million credit facility backed by a dozen lenders, including Wells Fargo Capital Finance, Morgan Stanley, Barclays, and UBS. Our customers represent a great cross-section of American small businesses,” says Howard Katzenberg, CFO of On Deck Capital, which serves more than 700 different industries in the U.S. and Canada. The publicly traded financial platform has funded more than $3 billion in loans since it made its first loan in 2008. 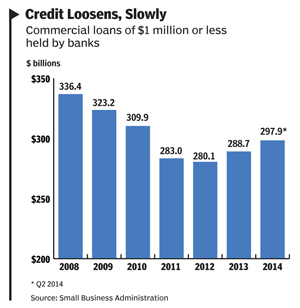 Last year it originated $1.2 billion of loans, a 152% increase over the previous year. When evaluating loan applications, OnDeck looks at mostly business-related information — transactional data and cash flow, history, business credit reports — “anything we can get our hands on,” says Katzenberg. “We collect over 2,000 data points per application.” Applicants may be required to upload bank and credit-card statements; all is grist for the lender’s algorithms. The company doesn’t disclose its approval rates, but the CFO says loans can be approved in minutes and funded as fast as 24 hours. To qualify for financing, a company must have been in business one year and have at least $100,000 in annual revenues. The lender offers two products, term loans and lines of credit. Loans range in size from $5,000 to $250,000, with terms of 3 to 24 months. Fixed daily payments are deducted from the customer’s bank account on a daily or weekly basis, depending on the cash-flow profile of the business. Lines of credit go up to $25,000 and are repaid on a weekly basis. Over half of OnDeck’s customers renew their financing, says the CFO. Evidently they put the money to good use: Companies that have taken three loans with OnDeck have seen their revenues grow by 25% on average between the first and the third loans, says Katzenberg, while their bank balances have gone up 42%. How are OnDeck’s loans priced? “It’s largely a function of the term being offered,” says Katzenberg; generally the shorter the term, the higher the interest rate. The borrower’s OnDeck Score, a proprietary measure of creditworthiness similar to a FICO score, also comes into play. OnDeck typically quotes term loans in “cents on dollar” terms and lines of credit with an interest rate. OnDeck’s two-year loan, called Term 24, carries an interest rate “in the mid-teens,” says Katzenberg. All told, the weighted average APR for OnDeck’s term loans in the second quarter was 46.5%, he says. Katzenberg says an alternative lender should always supply complete information on interest rates and amortization schedules on request. 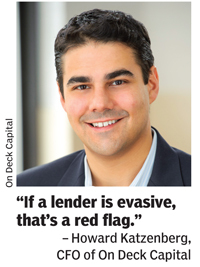 “If a lender is evasive, that’s a red flag,” he says. For that matter, the CFO says borrowers should also vet alternative lenders by consulting online reviews and the Better Business Bureau (OnDeck is rated A+), as well as by speaking with the lender’s salespeople — have they done business with similar companies and seen similar opportunities with respect to the use of loan proceeds? OnDeck’s own funding comes from a number of sources, including bank credit facilities and OnDeck Marketplace, which sells small-business loans to institutional investors. The lender raised $200 million in its December 2014 initial public offering, which priced at $20, and $175 million in a 2014 securitization. As this issue went to press, OnDeck revised downward its revenue guidance for the year, citing in part increased competition for small-business customers from traditional lenders and new market entrants. The increased competition isn’t good for the company, whose stock fell on the news — but it may be good for small businesses seeking credit. Edward Teach is Editor-in-Chief of CFO. CORRECTION: This article previously stated that On Deck Capital makes loans ranging from $25,000 to $250,000. In fact, the firm’s loans range from $5,000 to $250,000. The article has been updated accordingly.